Home » Posts Tagged "translations"
Olive the Sheep’s U.S. Tour! Announcing the launch of my latest translation from Portuguese, an innovative blend of read-aloud picture book and advice book for caregivers. A roundup of my teaching, translation, and writing in 2017 and my plans for a YA historical fiction series, now in progress. 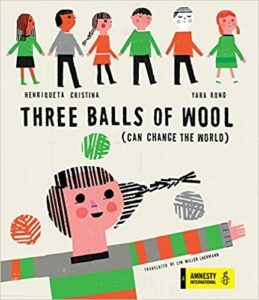 A review of Three Balls of Wool in American Craft magazine and some thoughts on how picture books from other countries reflect their place and time. Recapping a panel at the American Library Association annual conference on translated literature for teens and a recommendation of a timely translation.